TRACK & FIELD Moving down a league allows runners to dominate the Montclair meet. Senior Thomas Ear, left, and junior Lukas Amare ran 5:02 and 4:30 in the mile, respectively, against Montclair. Sprinting into the new season at top speed, Diamond Bar High School track and field raced past Montclair in its first league meet of the year. 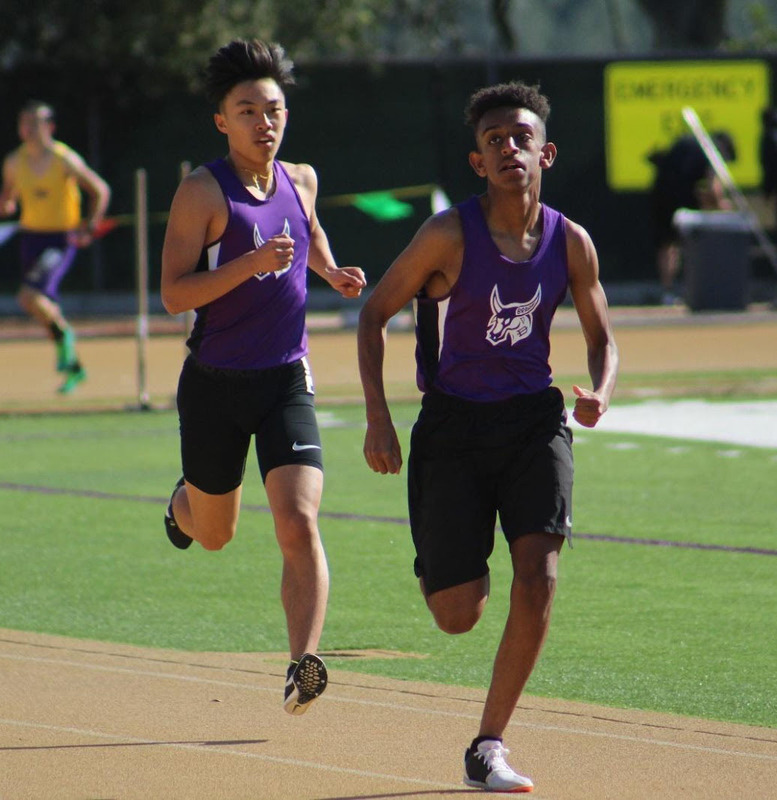 At the home meet last Wednesday, The Brahmas dominated the track as the boys team claimed all of the top three scores in the 100, 200 and 400 meter races. Sophomore Jadyn Sanchez scored first in both 100 and 200, and sophomore Daniel Marquez took the 400. The girls, meanwhile, took all three top spots in the mile race, with sophomore Cameron Tsao coming out on top, as well as two of the top three in the 200, 400, 800 and 3,200. Hurdles took another clean sweep with Diamond Bar in the top three, with seniors Abigail Nakaishi taking first place in girls 100 meter and Matthew Uballe in boys 110. On the field, girls took all top three discus spots, with sophomore Kyra Ruiz coming in first, and two of the top spots in both long jump and shot put. One Brahma on the boys team, senior Braulio Michel, made third place in high jump. By moving down one league from Palomares to Mt. Baldy, the team will face new schools at a level different from past years, in which the Brahmas competed against Ayala, Claremont and Bonita. According to Cooke, Diamond Bar usually performs strongest in its running events while field events have traditionally been a weakness. Though some high performers manage to stand out in every event, most points lost during preseason were on the field. Currently, the sprinters have been prioritizing strength training along with the throwers, who have been in the weight room almost every day. Distance runners have focused on increasing speed and endurance. The sprint team has also been looking at their handoffs and practicing starting off of blocks. The loss of a few high-scoring senior hurdlers last year leaves Diamond Bar with a young team. According to hurdles coach Terry Ford, however, the runners’ will to learn has been a major strength. Saturday in the Covina Invitational, three seniors qualified for the Arcadia Invitational in April: senior Kai Smith for high jump, Sanchez for the 400 meter and Uballe for 110 meter hurdles. The Brahmas’ next league meet will take place tomorrow against Chino High School.